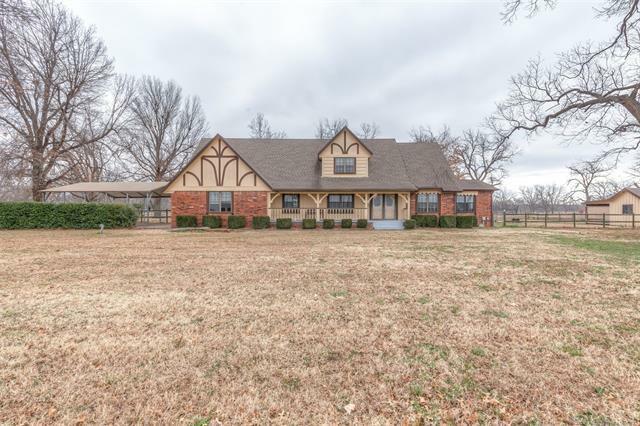 Updated home in picturesque setting on 20 acres (m/l), moments from HWY 75 & Bixby conveniences. Expansive, flex floorplan. Large granite kitchen w/tons of storage & sunny breakfast area opens to great room w/ wood burning FP. Light-filled sunroom w/stunning views of pecan grove. Spacious master down w/HUGE spa-like bath. Large game room/bed w/adjacent study up, plus 3 beds, living area. Large deck/patio for entertaining! Horse/cattle ready; fenced/cross-fenced. Barn, covered storage/shop, loafing sheds.